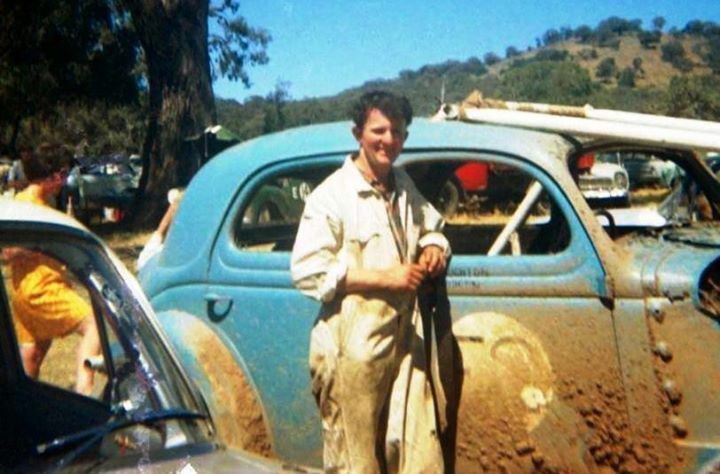 The Euroa Hot Rod Club was formed in 1966 with its track located just off the Hume Highway behind the Euroa Clay Products factory. The track was a graded local sand / gravel surface, a circuit running clockwise with a sharpe U-turn right hander in the middle. The short circuit was just over 880 yards, making it a true half miler. Basically unfenced apart from the Pit and Spectator areas, trees proved an additional hazard. The officials, starter and commentator occupied a rather hazardous location in the centre of the circuit. Inaugural President was Barry Ellis. At one meeting in 1970 a total of 158 cars were recorded with gate takings a record $1,400, In 1974 the club changed its name to the Euroa Speedway Club. Most of the profits from the gate were donated to various local charities. Euroa often attracted large fields to there race meeting. Photo: Ray Reid collection. Ray Petrie rounds Berties Bend in his FJ Holden. Photo: Ray Reid collection. Trevor Peters leads Barry Hall in the FJ Holden followed by Alan Harris in the EH Holden. Photo: Ray Reid collection. Eric Mann 55 - Tino Leo 85 - Bob Haynes S76 prepare for a standing start. Photo: Ray Reid collection. By September 1979 the Euroa Speedway Club had made a loss on its last two "Home" meetings, and then cancelled its August meeting due to bad weather. The Euroa Club next ran a very successful meeting at Nagambie Speedway for the 1979 N.E.S.A. Modified Saloon Car Championship, assisted by Nagambie members. New Euroa President Alan Luscombe, previously from Nagambie said: "It was pleasing to see such a fantastic roll-up of cars, both Modified A's-B's and Standard, it goes to show that the majority of drivers in the N.E.S.A. prefer to race speedway and not short circuit"
Ash Hubbard in the 27 Torana beside Barry Hall Torana with Tony Nicholas lining up behind in the 50 Torana. The club held its last meeting in Euroa at Easter, 1980, Although the Euroa track closed after that, it appears that the Euroa Speedway Club continued for at least another 12 - 18 months, Around 1980 the Freeway for the Uuroa Bypass of the Hume Highway was commencing and passed through the top end of the pit area, so acquisition of the Speedway track land for the by-pass may have been a major factor. One of Euroa Speedway Club's main sponsor and supporters was "Andy's Service Station", situated on the hume highway in the middle of town . Not only did they support their own racing team but also sponsored the Local Cup, run each meeting for Euroa Club Members. This consisted of a perpetual trophy together with a small replica which the winner could keep. Euroa hosted the N.E.H.R.A. Open Saloon Car Titles for two out of three years, in 1974 and 1976, demonstrating that it was highly regarded by our top drivers. There were frequent comments in various Speedway papers complimenting Euroa on its excellent track surface. On Sunday, April 11th, 1976 Euroa ran what was probably its biggest meeting - The Euroa Trader's Derby - sponsored naturally by local businesses. The Open Saloon Car event offered $1,000 prizemoney paying down to 6th place. A massive field of entries was received with strong fields from local clubs, other districts and interstate. ﻿﻿﻿Two major incidents entertained the large crowd,Firstly when Tony Nicholas was controversially disqualified in his heat and then excluded from the final when the N.E.H.R.A. Safety Officer instructed the Cheif Steward that this should happen! 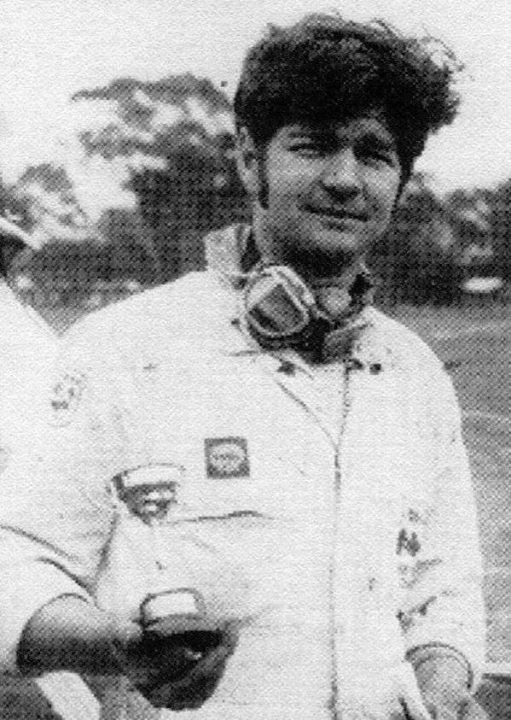 Also during the running of the event Fred Sutherland crashed spectacularly when "Little Big ﻿Wheels" hit some tyres in the back straight , becoming airborne, rolled, and came to an abrupt halt against a strainer post. The event was won by Neville Eltze of Horsham in a Ford V6 Capri, with second place going to G.V.A.C. 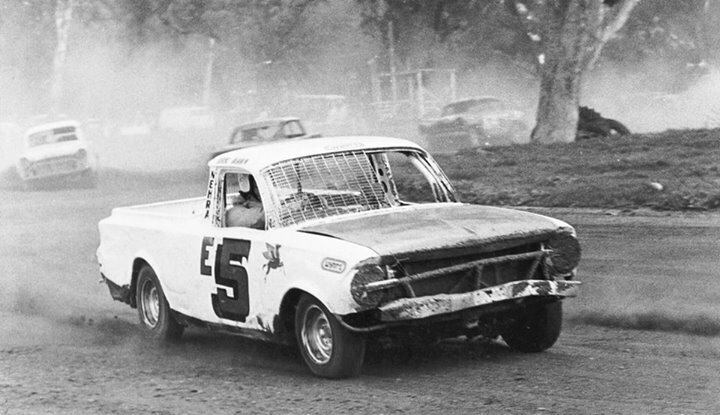 's Ron Williams in an EH Holden and third to Lyle La-Velle Torana from Alexandra.